The Dangers of Bed Bugs - AllPest Exterminating, Inc. The Dangers of Bed Bugs - AllPest Exterminating, Inc. According to medical professionals, scientists, and even pest control professionals, there are many potential dangers of bed bugs. These insects are very small, flat, and extremely parasitic. They feed only on the blood of humans and animals. The insects are typically red to reddish-brown in color. They are anywhere from 1mm to up to 7mm in length. While the insects feed on human and animal blood, they have the capability of surviving for many months without feeding on blood. Not only will you learn about the dangers of bed bugs in this guide, but, you will learn a few facts surrounding the pesky insects, as well. According to research, bed bugs are found all over the world – North America, South America, Europe, Asia, Africa, and several other regions. Once believed to only infect developing countries and areas that lack cleanliness, it has now been determined that these insects are all around the world and cleanliness does not matter. In fact, these insects have been found at extremely popular resorts, highly-rated hotels, apartment buildings, nursing homes, cruise ships, trains, airplanes, taxi cab, buses, and a variety of other locations. While most are found living in bed mattresses and box springs, the insects may also live in dressers, behind wallpaper, in carpeting, headboards, furniture, and other areas. Based on statistics, these bugs may travel over 100 feet within a single night; however, they tend to remain and live in areas that are 8 feet or less of where animals and people sleep. People and animals that receive bites from a bed bug may react in different ways. For many, the bite is nothing more than a minor skin irritation. For others, the bites may result in the onset of itchy and painful skin rashes that may become infected. 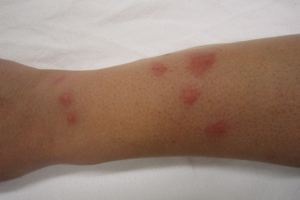 Individuals that are suffering from bed bug bites will often complain of consistent itching, burning sensations, body pain, and a loss of appropriate amounts of sleep. If a person or an animal is allergic to the bed bug bites, they have the potential to develop a serious allergic reaction that could lead to numerous other health complications. Now that you know and understand the potential dangers of bed bugs, it is time to learn how to identify an infestation of the insects. The easiest and most common method includes observing bites on the body that seem to appear after sleeping. In addition to this, you may observe a molted exoskeleton, bugs on a mattress that cannot, otherwise, be identified, rust-colored spots on your bed and/or furniture, and a musty odor that is relatively sweet. If you notice any signs of bed bugs, it is time to call a pest control professional. There ARE dangers of bed bugs. In this guide, you were introduced to the most common dangers and instructed on how to identify an infestation. If you are still reading, chances are, you feel that you have an infestation. The most promising treatment for bed bugs is the new heat treatment. This is because of the fact that today’s bed bugs have developed a resistance to insecticides. Today’s professionals are depending on heat treatment in order to eliminate bed bugs because it is the most productive means of elimination currently available. To learn more about this heat treatment for bed bugs, click HERE.